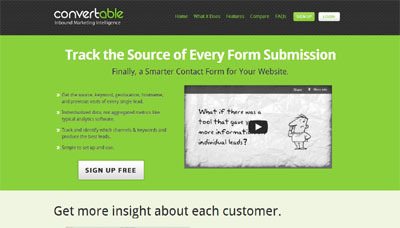 Convertable allows web site owners to capture analytics data with each contact form submission individually and provides tools to continue to track those leads through the sales/purchase process. Companies can see (in real-time) the original traffic source, keyword, location, pages viewed, visitor history (and more) attached to each email. Typical analytics software (like Google Analytics) only gives you general aggregated data with no information about the individual customer (or how they found you). CRM software (like SalesForce) ignores analytics altogether, providing only the information that the user fills out.